Make sure you are logged into your account. Once logged in, navigate to the auction you are wanting to participate in. Note: Quick way to navigate to this auction would be to select My Bidspotter in the upper right of the site and then My Auction Sign Ups in the upper right of the My Bidspotter page. As long as the auction has the auction has been pushed to the live platform (typically 1 hour before the auction start time) and you have been approved by the auctioneer, you will see a Bid live now button. Select Bid live now and a separate window will open. After the Live applet has been opened, you will be prompted to login to the applet before you can start bidding. On the left side of the applet it will show you the current lot that is up for offer. Here you will be able to see the lot number, description/title, and images. Below the image there will be a current price displayed. This will be the highest bid that is currently placed on the lot. The asking price will display the next available bid. If you place a bid on the offered lot, it will be placed for the amount that is displayed to the right of ASKING. Within the live bidding software, you will be able to place a bid by selecting the blue Bid Now button. 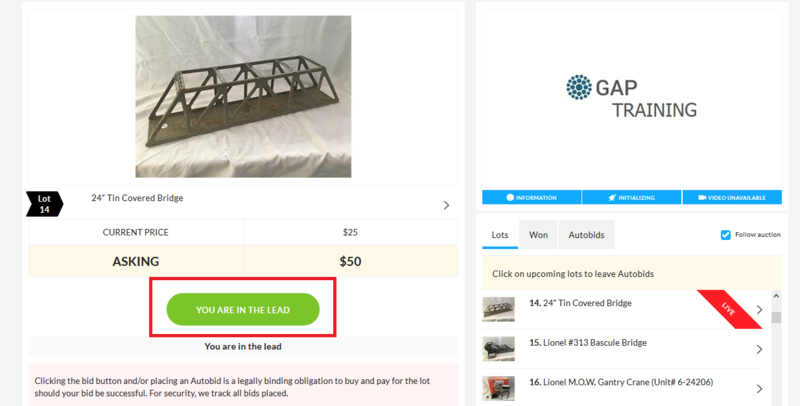 After a bid is placed, the button will change to be green and display You are in the lead. When bidding on a lot has ended the bidding button will be grayed out and say Bid. On the right of the applet you will be able to see more information including the lots of the auction, won lots, lots you've placed an autobid on, auctioneers contact information, audio status, video status and the auctioneer logo. Below the auctioneer logo the first thing you will see is three blue buttons, sometimes referred to as the Status bar. This will allow you to access the auctioneers contact information as well as view the status of your audio or video connection. To view the auctioneers contact information, select Information. If the Audio button states Audio Available, that indicates the auction has audio available for the auction but it is not currently activated in the applet. To activate the audio, simply click Audio Available until it reads Audio On. If the Video button states Video Available, that indicated that the auction has a video available for the auction but it is not currently activated in the applet. To activate the video, simple click Video Available until it reads Video On. Audio On or Video On indicate that the audio or video available is currently active. Note: If you do not hear the available audio and the audio button is stuck on Initializing, please consult your flash settings as instructed here. Located under the auctioneer logo and status bar you will see three tabs that can assist in navigation of the auction applet. The Lots tab will show you all of the lots available in the auction. The Won tab will show you all of the lots that you had the winning bid on. Note: All winning bids are subject to the auctioneers approval. The Autobids tab will show you all of the lots that you have placed an autobid on. Here you can adjust your autobids for a different amount, or remove the autobid all together. Click here for more information on how groups work in live auctions. The auction has ended, now what? Once the auction finishes and is reconciled, you will receive a "Winners Notification" and/or an invoice by email which should contain information on all of the lots you've won. It should also include all of the information you may need in regards to arranging payment, lot removal, and perhaps even shipping. Depending on the event, this may come from within moments after the conclusion or may not be sent until the next business day.